Origin: Nudist Beach ni Shuugaku Ryokou de!! Along with her friend and fellow otaku Inui Shizuha, Nogi Kiyona attends a school trip to a nudist beach. There, she makes carnal discoveries alongside Shizuha. 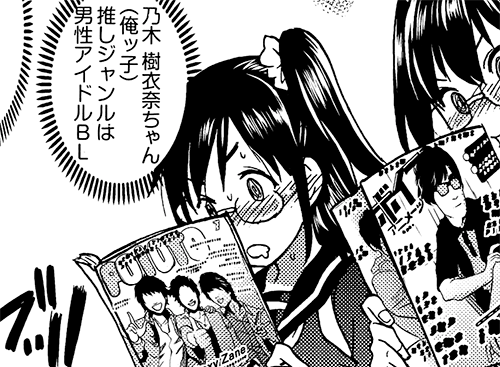 Nogi is particularly a fan of male idol BL. This entry was posted in fujoshi, fujoshi files, manga and tagged nudist beach ni shuugaku ryokou de. Bookmark the permalink. ← Love Live School Idol Festival and Ten Fes: Rise of the Normal Girls? Is this from a H-doujin? Searching the title name only gives me that. Not a doujin, but it is 18+.